Call on the power of the moon and control the game with this collection of essential Mountains, now with a stunning new look. Each Signature Spellbook: Blood Moon will contain nine cards: eight cards and a foil version of one of those eight cards at random. Now and then, GoodGamery publishes real preview cards. In 2010, Wizards provided us with a preview card, Quag Sickness. In 2011, GoodGamery provided our own joke preview card, the random dual land generator. This year, the world will end. 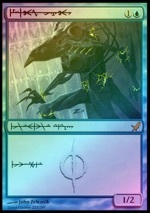 However, before that, we have received a new preview card from Wizards. This card is from Avacyn Restored, set to be released sometime soon. Let the spoiler season begin! Here at Wizards of the Coast, our work – like the work of Sir Isaac Newton before us – is all about experimentation. Whenever we introduce an exciting new idea, we are testing the waters to see what works and what doesn’t, and what we can rehash further down the line. Over the years at GoodGamery we’ve had our fair share of exciting preview cards. As part of the Rise of the Eldrazi alliance we spoiled the Timmy-est card in a Timmy set, Spawnsire of Ulamog. For Magic 2011 we eschewed such whimsy for a card the average player on the street could really connect with: limited workhorse Quag Sickness. Those were heady days indeed, but two sets have gone by since then without so much as a whiff of exclusive news. Has GoodGamery been forgotten? That’s a rhetorical question. The answer is no. Good Gamery’s own dear friend and forum user PMega acquired the very first pack of New Phyrexia, likely from some unnameable inside source. Next, he opened it for our amusement. On the plane of Grimneath, Unblinking Bleb would be an eye. Elsewhere in the Magic universe, he isn’t, despite all apparent evidence to the contrary. This isn’t surprising, really. In Magic’s history, there has been a long tradition of almost-but-not-quite-actually-eyes. There have been artifact eyes, creature eyes, land eyes, and enchantment eyes. There have been spells that you’d fairly expect to shower you in an explosion of eyes. But there have been few actual eyes.